Searching for a soy free grab and go dinner the other evening, I ran across this lovely at the Laurelhurst Whole Foods Market. 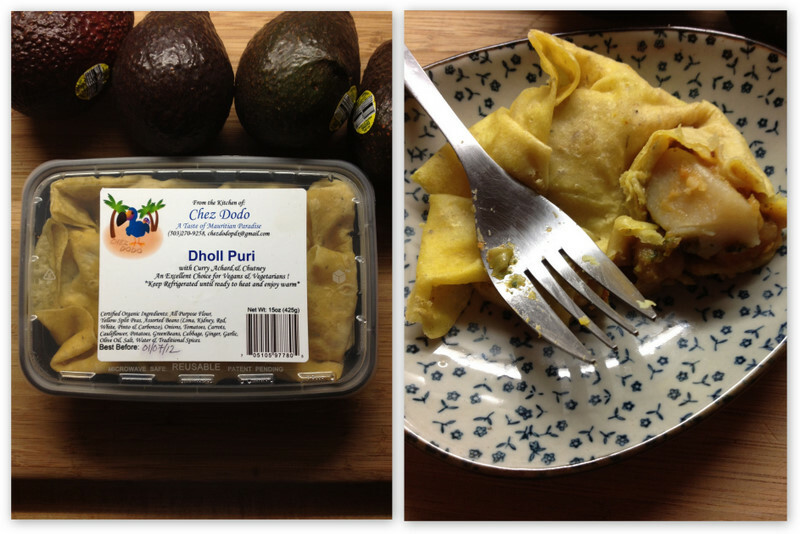 Produced by Chez Dodo, Dholl Puri is a traditional Mauritian street food. Flat bread is stuffed with beans and vegetables, and when heated is both absolutely delicious, and a carb lover’s dream: bread, beans, potatoes. I would guess that this could, when accompanied with rice, some veggies, a salad, feed two, but I ate it all. And I don’t regret it one bit. Here’s where I, again, disclose that I work for Whole Foods Market, and the views expressed and mine, and mine alone.